A KCHjEOPTRRYX MAQRUBD3 (Owes). In Lb« NlUonil Coll&etion, Bntiifc Khhuici. 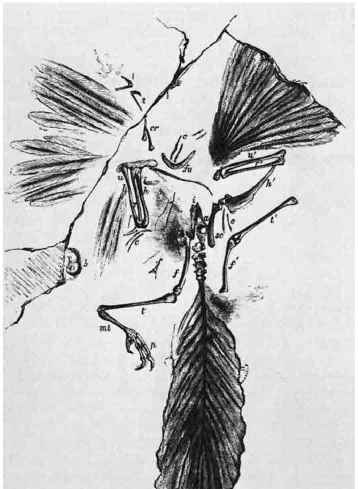 Richard Owen's drawing of Archaeopteryx shows the mixture of bird-related features such as a 'wishbone' (fu -furcula) and feathers along with a typically reptilian long bony tail. However, it was Huxley who recognized that it provided an excellent example of Darwinian evolution. deposited in shallow marine lagoons dotted with islands, the fine-grained muds were lithified into limestones that could easily be split into thin flags, which were greatly valued for high-quality lithographic printing stones. Splitting the rock also often revealed remarkably well-preserved fossils that the quarrymen put on one side for sale to collectors. In i860 a small, 5-cm-long fossil feather was found in the Solnhofen quarry, preserved as a black impression on one of the rock surfaces. With its asymmetric shape and details of individual barbs preserved as if printed, the feather clearly had a very modern look and was evidently designed for flying. It was realised that where there was a feather there should be a bird not too far away and the following year Archaeopteryx was found. News of the discovery soon spread throughout the palaeontological world and Richard Owen used his considerable influence to get the British Museum to buy it in 1862, along with a magnificent collection of 1703 other Solnhofen fossils for £700, a considerable sum in those days. The owner, Dr C. F. Haberlein used the money to provide each of his six daughters with a dowry. Owen published a masterly description of the fossil, showing that while it was clearly a bird, it also preserved some features that were otherwise only seen in the embryos of living birds. However, it was the English biologist and evolutionist Thomas Henry Huxley who first realised that Archaeopteryx possesses a remarkable mixture of reptilian and bird characteristics. In this, the fossil provided something that Darwin thought the fossil record would never be able to do: it represented an ancestral 'link' between two major groups of backboned animals, the reptiles and the birds. As such, it was an excellent example of Darwinian evolution and Huxley made the most of it in his proselytisation for the Darwin/Wallace theory of evolution. Thomas Henry Huxley, 1825-95, trained in medicine, was assistant surgeon on HMS Rattlesnake (1846-50) and professor of biology at various institutions in London. He became a vehement supporter of Darwin and his theory of evolution and wrote many books and articles; president of the Geological Society of London (1868) and the Royal Society (1883-5). Huxley knew that in the late 1850s, the skeleton of a small bipedal dinosaur, Compsognathus, had also been found at Solnhofen and that it closely resembled Archaeopteryx. For Huxley, there was no inherent problem, even in linking separate classes of animals despite their seemingly different anatomy and physiology. It reinforced his view, as did Owen's embryological evidence. Huxley was a particularly persuasive speaker, in a way that the shy and private Darwin was not. There is little doubt that a great deal of the growing acceptance of Darwin's revolutionary ideas was due to Huxley's powerful advocacy through his public lectures and published essays. Archaeopteryx was a medium-sized bird like a magpie, about 300-500 mm long, from the tip of its snout to the end of its long, bony, feathered tail, and stood some 250 mm high. The skull was lightly constructed with large eyes and optic lobes in the brain, showing that it depended on sight as a key sense for survival. The narrow, pointed, beak-like jaws were armed with widely spaced, sharp teeth. The neck was curved and led into a short back and long, straight tail with 22 vertebrae. The forelimbs had three greatly elongate fingers, each ending in a long, curved claw. The pelvis was generally like that of a small theropod reptile, but there has been some controversy over the exact form of its construction. The question is whether the pubis was aligned vertically, as in some dinosaurs, or backwards, as in living birds. Compression of specimens during fossilisation often creates such problems. The hind limbs were particularly reptile like, with the inner toe being very short and lying at the rear of the foot. However, this condition is also typical of many living birds. As Huxley pointed out, the foot of a chicken embryo is hard to differentiate from that of a reptile. find today: it saves energy and the risks of returning to the ground all the time. Gliding could then have evolved more easily into powered flapping flight, which would have extended the animal's range. 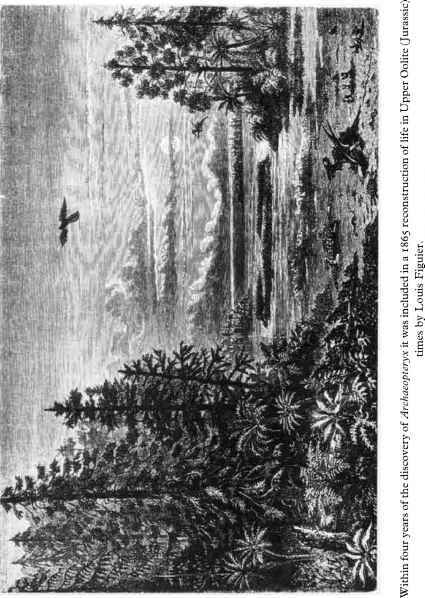 One snag with this model for Archaeopteryx is that the environment in which the bird lived did not include any substantial trees. The only available land seems to have been some low-lying islands within the lagoon where the Solnhofen lime-rich muds accumulated. With the prevailing hot and fairly arid climate, these islands would not have been able to support tree-sized vegetation, but rather a sparse, low scrub of bushes separated by open ground. Hardly the sort of environment for an arboreal glider to prosper in. 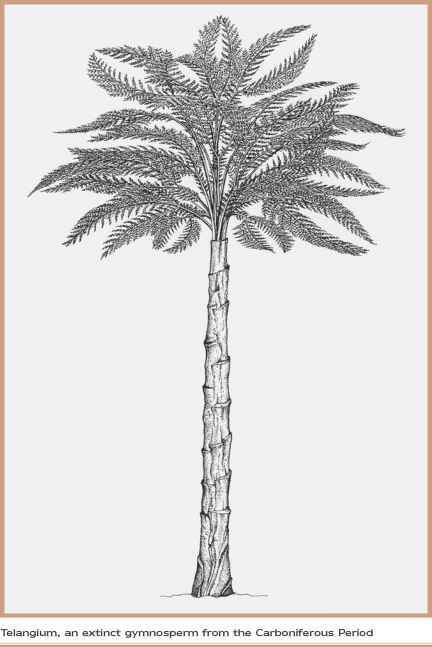 The plant fossils from the same deposit support this reconstruction, since they lack any wood and only preserve the remains of some small, shrubby conifers Brachyphyllum and Palaeocyparis and bennettitalean plants, which only grew to about 3 m high. Nevertheless, there is no doubt that Archaeopteryx was capable of climbing and flying. The primary wing feathers were asymmetric and that means one thing only - flight, even if it was fairly clumsy and inefficient. Modern flightless birds do not have asymmetric feathers. Recently, scientists in London's Natural History Museum have been able to isolate part of the skull of their Archaeopteryx specimen and make a brain scan using high-resolution X-ray computed tomography. The brain is smaller than your little finger, but even so they found that its brain was remarkably similar to that of modern birds, with enhancement of those areas associated with movement and vision. Similar analysis of the brain in unrelated flying reptiles shows the same kind of organisation, indicating that such brain enhancement is probably intimately linked with active flying.